The Share Food Share Love Food Pantry was founded by a group of members of Faith Lutheran Church in 2015. While incorporated by members of the Church, and located in the basement of the church building, the Pantry was created as a community institution and chartered to be operated as an independent charitable corporation. The Pantry began distributing food to residents of Brookfield on December 19, 2015. The Pantry is operated as an agency of the Greater Chicago Food Depository. The Depository makes a daily impact across Cook County with a network of 650 pantries, soup kitchens, shelters, mobile programs, children’s programs, older adult programs and innovative responses that address the root causes of hunger. 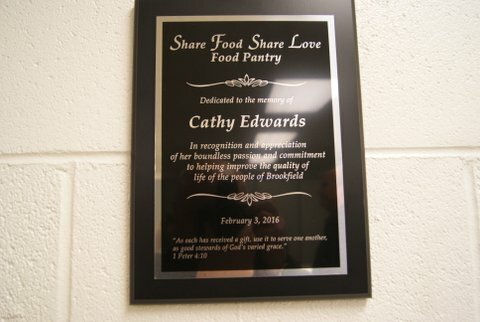 On February 3, 2016, the Share Food Share Love Food Pantry was dedicated to the memory of longtime Brookfield resident Cathy Edwards. Cathy was extremely dedicated to the Village of Brookfield, both through her service as an elected official and through the many organizations with whom she served. She was instrumental in the creation of the Pantry and was always very generous with her time and her counsel. To see more pictures from the dedication ceremony check out our Instagram page by clicking here. Working together to provide food security for the residents for the communities we serve.